Malaysia Airlines (MAS) has unveiled a new business plan aiming to restore profitability by significantly cutting capacity and increasing focus on the premium sector, which includes the launch of a new regional premium carrier in 1H2012. Several business units including maintenance, cargo and ground handling are to be spun-off, most likely in 2012, as part of a bid to free up capital required to fund rapid fleet renewal and the reinvigoration of MAS’ core business. MAS will swiftly phase out its B747-400 and A330-200 fleets over the next year, leading to a 12% reduction in total capacity. The decision to draft yet another new business plan at MAS, which has made multiple turnaround attempts over the years, hardly comes as a surprise following the landmark partnership agreement forged in Aug-2011 with long-time rival AirAsia. The agreement, which included an equity swap and the appointment of AirAsia Group CEO Tony Fernandes to the MAS board, inevitably required MAS to downsize and abandon its attempt to compete with AirAsia at the low end of the market. MAS will now focus entirely on the premium sector and adopt a strategy already deployed at leading Asian airline groups Cathay Pacific and Singapore Airlines (SIA). But MAS has a long and tough road ahead in winning premium customers and achieving the sustained profitability it hopes the new business plan will generate. MAS’ vision “to become the preferred premium carrier” will certainly lead to vigorous attempts by Cathay and SIA to defend their turf, positioning MAS as the underdog once again. MAS clearly had to do something after slipping back into the red for the first three quarters of 2011, putting MAS into what it refers to as “crisis” mode. The Malaysian flag carrier, which turned a profit in 2010 on the back of its previous turnaround plan, incurred net losses of MYR1.247 billion (USD392 million) through the first three quarters of this year (see Background information). MAS expects to post another loss in the current quarter and end 2011 with a loss of about MYR1.3 billion (USD410 million). The carrier claims its situation is even more dire than its last crisis in 2006 and if it does not reverse the current “unsustainable” trajectory it will be out of cash and bankrupt in 2Q2012. By cutting back loss-making routes and slashing overall capacity (ASKs) by around 12%, MAS is confident it can significantly reduce its losses in 2012. These immediate steps, which will be implemented as part of the first phase of the new business plan, are expected to improve the bottom line in 2012 by between MYR1.2 billion (USD380 million) and MYR1.5 billion (USD470 million). The carrier now expects to incur only a small loss in 2012 – likely less than MYR200 million (USD60 million) – and be cash flow positive by the end of next year. It is confident the new business plan will allow it to return to profitability in 2013. MAS believes sustained profitability is feasible once it completes all the initiatives identified in the new business plan, including collaboration on several levels with AirAsia, new partnerships with foreign carriers which will come as MAS joins oneworld in 3Q2012 and the spin-off of several non-core businesses. The carrier aims to have an annual after tax profit of MYR900 million (USD280 million) by 2016. The initial “recovery plan” will result in the discontinuation of MAS’ highly unprofitable routes to South Africa and Argentina, its only destination in Latin America. Other long-haul routes will also be axed but have not yet been identified by MAS’ new management team, which is led by new CEO Ahmad Jauhari Yahya. Most of the routes will likely come from MAS’ unprofitable European network because the carrier’s Middle East and Asia-Pacific networks are performing relatively well and its North American network was already slashed to only three weekly flights and one destination (Los Angeles) in the previous restructure. 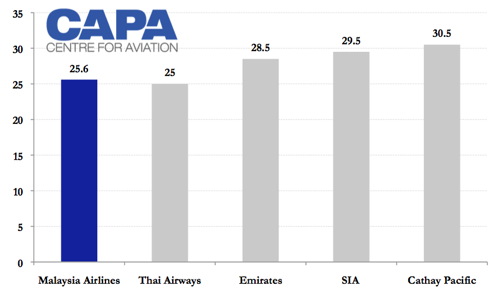 MAS acknowledges that over 40% of its current routes are unprofitable. While several long-haul routes will be dropped, MAS plans to increase capacity within Southeast Asia by adding frequencies to core markets in the region. MAS is hoping to cash in on the expected doubling of passenger demand in the Southeast Asian market by 2020. While MAS operates only five weekly flights to South Africa and Argentina (including two on a Kuala Lumpur-Cape Town-Buenos Aires routing and three between Kuala Lumpur and Johannesburg), they account for over 5% of MAS’ total international ASKs. MAS will also need to cut about 25% of its European capacity in order to achieve the goal of a 12% system-wide capacity reduction. This figure could be reduced slightly if MAS opts to also trim back its Australia/New Zealand operation. MAS now serves five destinations in Australia and Auckland in New Zealand but it is unlikely to cut back this operation significantly if at all because it is now seeking to forge a close partnership with Qantas, which is sponsoring MAS’ entry into oneworld. Qantas, which does currently not serve Malaysia, is one of several potential joint venture partners for MAS. The carrier says it is now “exploring JVs with selected partners” as part of its new focus, as identified in the new business plan, on alliances and partnerships. Australia and New Zealand now account for 22% of MAS’ international ASKs, while Europe accounts for 29%. Asia, where a slight increase in capacity is expected, accounts for 39% of total international ASKs. The carrier also has a large domestic operation, accounting for 48% of total seats, but on an ASK basis the domestic flights only account for 12% of total capacity. MAS expects the network changes alone will improve the carrier’s bottom line by MYR220 million (USD69 million) to MYR302 million (USD95 million) annually, starting in 2012. Some of the suspended routes may later be reactivated once the business is stabilised and the new premium carrier, which will feed the long-haul network, is fully up and running. With its smaller long-haul network MAS will focus primarily on the premium segment, leaving Malaysian long-haul low-cost carrier AirAsia X to focus on the budget sector. MAS’ new management team believes the carrier in recent years has lost its focus on the premium segment, resulting in a decline in the quality of its product. 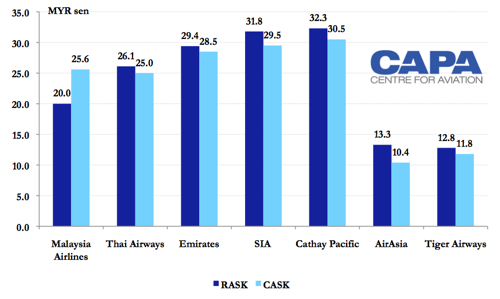 As a result, the carrier’s unit revenues have slipped significantly below leading Asian carriers such as Cathay and SIA. 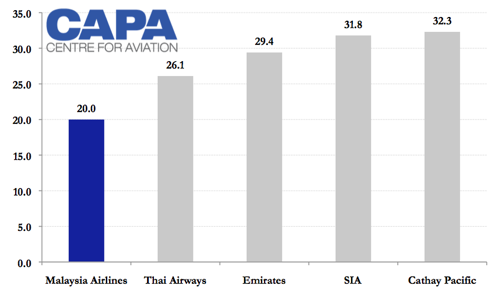 Not only have MAS' revenues dipped below premium Asian carriers, MAS' revenues are closer to those of AirAsia and Tiger Airways (USD 2.2 cent difference) than full-service carriers like SIA and Cathay (USD 4.8 cent difference). 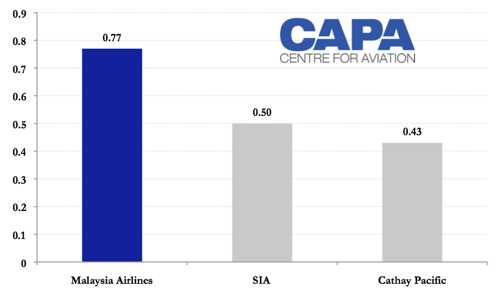 MAS' costs, however, are much closer to SIA and Cathay (USD 1.4 cent difference) than LCCs. MAS' costs are 2.5 times those of AirAsia and twice those of Tiger. While MAS can achieve cost cutting, any gains will be far from matching AirAsia and Tiger, underscoring the need for MAS also to drive revenue increases and improve its premium positioning. MAS will now invest in trying to win back premium long-haul passengers, primarily through a major revamp of its product. A rapid phase-out of MAS’ ageing widebody will be pursued and simultaneously new passenger amenities will be introduced. By the end of next year the carrier will be operating only three types of modern widebody aircraft – A330-300s, B777-200ERs and A380s. A330-200s and B747-400s will be phased out by the end of 2012. MAS expects the average age of its fleet will decrease over the next four years from 13 years to only five years, giving it a younger fleet than Asian leaders AirAsia, Cathay Pacific and SIA. Additional A330-300s and MAS’ first batch of A380s will be delivered in 2012. MAS, in its new business plan, confirmed its first A380s will be deployed on the Kuala Lumpur-London route. MAS says the A380 will be configured with a “best-in-class product and key innovations in customer service” which will help drive improvements in its yield and load factor. MAS’ London route, which is now served with double daily B747-400s, has suffered over the last several months from low load factors and yields. The A380 will result in more capacity at a time market conditions in Europe are worsening. But MAS is banking on the A380 allowing it to woo more premium passengers, having noticed the impact the A380 has had at other carriers in attracting new clients. MAS is also now pursuing a tie-up with oneworld member British Airways (BA), which currently does not serve Kuala Lumpur, leading to a potential joint venture in the UK-Malaysia market and beyond. Qantas, which already operates A380s to London and has an existing joint venture with BA on the UK-Australia kangaroo route, could also end up in this partnership. While the new modern widebodies come with higher acquisition costs, fuel and maintenance expenses will be significantly reduced. MAS points out that swapping the B747-400 for A380s will improve fuel costs per ASK on the London route by 20%. The replacement next year of A330-200s with A330-300s will result in a per ASK fuel burn improvement of 29%. Banking its new focus on the premium end of the business will lead to significantly higher unit revenues for MAS while its unit costs, which are already lower than most other Asian full service carriers, are further reduced. MAS now benefits from lower labour costs than nearly all its peers in the Asia-Pacific region but productivity improvements are required. MAS will also separate its widebody and narrowbody operations, following the model used by SIA and Cathay which use their SilkAir and Dragonair subsidiaries, respectively, to operate the group’s narrowbodies. Thai Airways also recently adopted a similar strategy, using its planned new regional unit Thai Smile to operate narrowbodies while Thai mainline plans to phase out its remaining narrowbody aircraft. MAS will begin to shift early next year all of its B737-800s to its new regional premium carrier, which has not yet been formally named, although could be called Sapphire. The new carrier will initially operate regional international routes within four hours of Kuala Lumpur, including to destinations in Southeast Asia, the Indian subcontinent and greater China. A preliminary initial route map for the new carrier includes six big ASEAN destinations – Singapore, Jakarta, Manila, Hanoi, Ho Chi Minh City and Bangkok – as well as the east Malaysian domestic destinations of Kuching and Kota Kinabalu. But MAS says, domestic routes will at least initially continue to be operated under the MAS brand with B737-400s (expected to be phased out by 2015). MAS states that the new premium regional carrier will have a separate management structure, allowing it to focus on the “unique needs of regional premium passengers”. High frequency services will be offered to ensure a convenient schedule for business passengers. The use of B737-800s will allow MAS to significantly increase frequency on its regional international routes because MAS now uses widebodies on these routes alongside B737s. MAS says the switch to B737-800s will also result in cost improvements because the B737-800 is 26% more efficient on a fuel cost per ASK basis than the A330-200 and 23% more fuel efficient on a fuel cost per ASK basis than the B737-400. MAS says the new premium carrier will be the exclusive operator of its B737-800 fleet. CAPA data shows MAS now operates 14 B737-800s with 40 more of the type on order. Several additional B737-800s will be delivered next year as MAS now plans to take delivery of a total of 23 aircraft in 2012 – a mix of B737-800s, ATR 72s, A330-300s and A380s. MAS is confident that the new regional carrier, with its modern fleet and high product standards, will better meet the needs of Asia’s regional premium passenger. While most of the growth in Asia in recent years has been at the budget end of the market, MAS sees growing demand for premium short-haul services as income levels in Asia are on the rise. It also sees a need to provide an improved regional product for premium passengers coming off its long-haul flights. MAS is banking on the combination of a revamped premium product on long-haul flights and the new regional premium carrier will enable it to win back premium customers lost in recent years as its fleet aged and its product languished. Yield management improvement, membership in oneworld and new sales initiatives, aimed primarily at growing corporate revenues and ending its practice of putting tactical sales promotions ahead of brand-building, will further aid in these efforts. MAS expects this "win back customers" portion of its new business plan to generate a profit impact of MYR394 million (USD124 million) to MYR477 million (USD150 million) annually. This will be achieved by improving yields by 19% in 2012 while unit costs are expected to remain flat. Another MYR309 (USD97 million) million to MYR392 million (USSD123 million) in annual profit improvements have been identified through cost reductions. Some of this will be generated by closing stations and improving productivity. Procurement costs will be reduced as MAS begins to pursue joint purchasing opportunities with new partner AirAsia. MAS has already identified MYR100 (USD31 million) million worth of savings from joint purchasing initiatives with AirAsia. The new partnership with AirAsia is also expected to have a big impact on the revenue side as MAS begins to use AirAsia to improve its network connectivity. MAS, in its new business plan, reveals that a connection service will be launched on non-overlapping routes. The new connection product with AirAsia will allow MAS to gain access to over 24 cities which MAS does not serve, resulting in additional feed to MAS’ long-haul network. MAS also points out that linking the two airline groups’ networks will help advance the vision of the Malaysian Government, which still owns a majority stake in MAS, of creating a major aviation hub. A final MYR255 million (USD80 million) to MYR337 million (USD106 million) in annual profit improvement has been earmarked through MAS’ “keep it simple” initiative. This will primarily be driven by the spinning off of several divisions including catering, training, ground handling, maintenance and cargo. For training and ground handling, joint ventures with AirAsia will be pursued while some of the other business units could be sold, contingent on market conditions, providing cash to help MAS finance its investment in new aircraft. At least for now MAS expects to keep its frequent flyer programme and holiday division as fully owned subsidiaries. MASwings, which operates turboprops on subsidised routes in rural east Malaysia, will also remain a fully owned subsidiary. Regional subsidiary Firefly, which operates turboprops in west Malaysia, is already in the process of being merged with MAS’ new narrowbody operation. In forging its partnership with AirAsia in August, MAS decided to drop Firefly’s B737 low-cost operation, which was launched last year and posed a new competitive threat to AirAsia. Firefly was a major component of MAS’ previous strategy of having a second budget brand help the group compete against AirAsia in the domestic and regional international markets. But while Firefly’s turboprop operation, which was launched in 2007 and followed a hybrid regional low-cost airline model with some frills, was profitable, the newer jet operation was racking up big losses until it was shut in September. MAS’ new management team says the previous strategy of focussing on Firefly was a mistake because it diverted resources away from its premium business. Firefly, which was growing fast and had been allocated 30 B737-800s from MAS’ order book, left MAS mainline with one of the oldest fleets in Asia. MAS claims the result was its mainline product languished, leading to lower yields and a decline in customer loyalty. In reality, MAS pulled the plug on the Firefly B737 operation too quickly to call its previous strategy a failure. Having a separate brand for the larger budget sector of the market could have proven to be profitable in the long run. Most of MAS’ peers including Garuda, SIA and Thai continue to pursue multi-brand strategies with separate brands for full service and low-cost operations. MAS, in some respects, is still pursuing a similar strategy, having traded its Firefly brand for a tie-up with AirAsia. This was probably a smart move given the strength of AirAsia in its home market of Malaysia. But Firefly could have potentially been successful and MAS could have potentially invested simultaneously in both its premium and budget products. After all, this is what Garuda, SIA and Thai are now doing. It is a huge gamble. Wooing premium passengers and securing new corporate accounts is always an uphill battle. Membership in oneworld and brand new aircraft with industry-leading products will help. But MAS will also need to be transformed as a company and be relentless in its drive “to become the preferred premium carrier”. MAS has an unenviable track record of failed turnarounds and transformations. Its rivals will be watching closely as MAS takes a stab at yet another new strategy. MAS late last month reported an operating loss of MYR156 million (USD49 million) and net loss of RM478 million (USD150 million) for 3Q2011. The carrier’s year-to-date operating loss grew to RM880 million (USD277 million) and year-to-date net loss grew to RM1.247 billion (USD392 million). The losses so far in 2011 follow a profitable 2010 in which MAS was in the black for three of the four quarters. Revenues in 3Q2011 were up 5% to MYR3.565 billion (USD1.12 billion), including an 11% increase in passenger revenues and a 15% decrease in cargo revenues.